" We moved " to 1100 Grosser Road Suite D Gilbertsville Pa 19525, which is right off of route 100. If traveling south on route 100 turn left onto Grosser Rd. If traveling north turn right onto Grosser Rd. Valero station on corner. Go approx. 1/8 mi. 1100 on right building sits on hill otherside of pond. 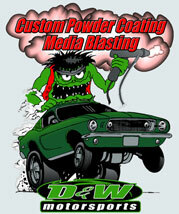 At D&W Motorsports no job is too small, production jobs are welcome. 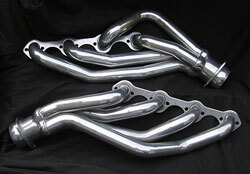 We can powder coat most large parts! We use only high quality virgin powder. 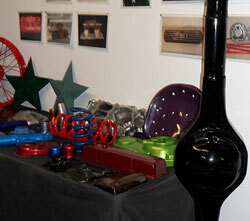 We have all the standard and many custom colors available including metalics, translucents, and iridescents. 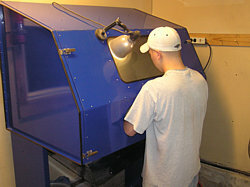 All parts are thoroughly media blasted, cleaned and inspected prior to performing the powder coating process. MAKE THOSE OLD PARTS NEW AGAIN ! Glass beading does not harm base metals or leave cilica residue. Removes rust, paints, oxidation, baked on oil residue. For tougher applications aluminum oxide is used this does not harm or texturize most base metals. Shift Like the Pro's with a Grab A Gear shift knob!!! Click here for more info on our EXCLUSIVE Shift Knobs! D & W Motorsports has serviced customers throughout Pennsylvania in Norristown,Boyertown Pottstown, Limerick, Schwenksville, Quakertown, Royersford, Spring City, Collegville, Perkiomenville, Sassmansville, Pennsburg, EastGreenville, West Depford NJ., King of Prussia, Weatherly Pa., Swoyersville Pa., Langcaster, Levitown, Mt.Clare, Barto, Bally, Oley, Birdsboro, Topton, Phoenixville, Fleetwood, Sanatoga, Reading, Malvern, Chestersprings, Red Hill, Langhorn, Perkasie, Mohnton, Harleysville, Souderton, Hatfield, Landsdale, Greenlane, Sellersville, Graterford, Frederick, Allentown, Norristown, Exton, Gilbertsville, Hereford, & Jeffersonville.